You can’t get closer to fighting for the world title without doing it than Kelvin Gastelum did at UFC 234 in February in Melbourne, Australia, unless the champion were to injure himself on the ring walk. Gastelum was supposed to challenge Robert Whittaker for the middleweight title on Feb. 9 in Melbourne. He’d attended the kickoff news conference successfully. He went through a grueling training camp with no problems. He did the pre-fight activities, like the news conference and the media tour and the open workouts, without incident. And then, both Gastelum and Whittaker made weight the day before. That was it. The fight was on. If Gastelum were good enough, and lucky enough, he’d leave Rod Laver Arena with the middleweight belt around his waist. The closest Gastelum came to having the belt around his waist is when he borrowed one from his buddy, flyweight champion Henry Cejudo, and walked around cageside as the fights went on with it flung over his shoulder. Whittaker got ill not long after the weigh-in, and eventually needed emergency surgery and had to pull out of the bout. There was no chance for a replacement, so Gastelum was left to just watch. Gastelum did everything right, made all the appearances he was supposed to make, did all the work, cut the weight, showed up ready to go and he still couldn’t make it. And what did he get? A heaping helping of scorn and ridicule from fans who clearly had no idea what it feels like to have a lifelong dream snatched from one’s hands just as it seemed it was about to be fulfilled. He used Cejudo’s belt to keep his name in the news and have people talk about him. It was the least he could expect after what had occurred. Fingers crossed, he’ll finally get the opportunity to compete for the interim middleweight title when he meets Israel Adesanya on Saturday at State Farm Arena in Atlanta at UFC 236. The expectation is that the winner will face Whittaker for the undisputed belt as soon as Whittaker is healthy enough to compete. Even though it’s for a belt, the fight Saturday won’t be quite the same for Gastelum, who wanted to win it the right way. To borrow an old adage, to be the man he wanted to beat the man. Instead, he’ll have to win twice in order to achieve that, and in Adesanya, he faces an opponent who presents a lot of matchup problems for him. Gastelum is 5-foot-9 with a 71½-inch reach, meaning he’ll give up seven inches in height and 8½ inches of reach to the 6-4 Adesanya. That is no insignificant difference. Here’s the thing about Gastelum that makes him a live underdog against Adesanya. 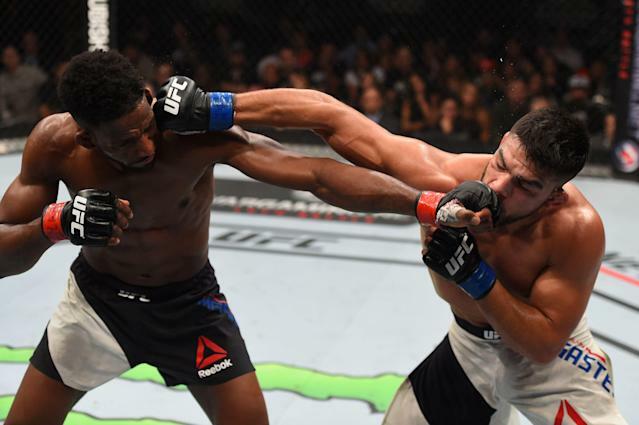 Gastelum gave up six inches in height and the same 8½ inches of reach to Magny when they fought in 2015 that he’ll give up to Adesanya. But he learned from it. He’s a guy in whom the whole has become greater than the sum of his parts, and he’s relentlessly worked to turn weaknesses into strengths. It’s not going to be easy against Adesanya, who appears to be a prodigy at MMA. He’s not just a fighter who has marketing hype behind him; he’s a tough and hard-nosed athlete who has everything — size, speed, quickness, power, accuracy, agility and a quick and versatile mind — to burst into stardom. This won’t by any stretch be a coronation, though. Gastelum has quite literally made a career of bucking the odds. The MGM Grand sportsbook has Adesanya a -175 favorite, with Gastelum the underdog at +145. 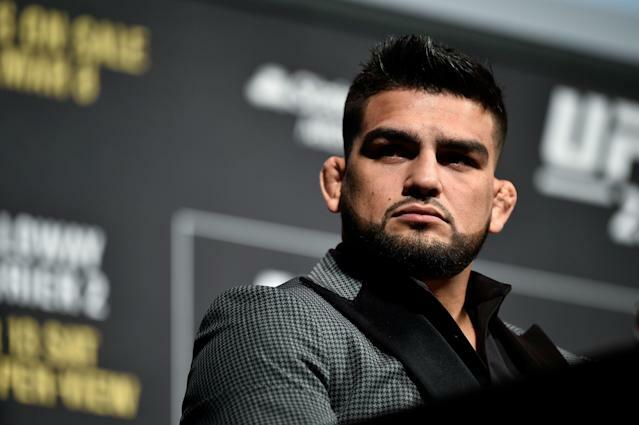 Frequently, the guys who buck the odds are those like Gastelum, who for years have heard they’re not good enough, or not big enough, or not something enough to win. Those types of athletes have had an extra level of motivation throughout their lives and they dare you to try to knock the very large chip from their shoulders. Gastelum has been here before. On Season 17 of “The Ultimate Fighter,” he was the next-to-last pick overall. He got to the finals against Uriah Hall and few gave him a shot to win. But Gastelum ground out a decision. He’s got a lot of disadvantages, but one huge advantage on his side: He’s been doubted for years, at every level of competition and in just about every sport he’s ever tried. He has overcome the odds, defied the critics and come out on top more often than not ever since. And no matter how good Adesanya is, he expects no difference this time around. The calendar has aligned to work in his favor.